Father Edmond J. Speitel poses next to the Mother of Perpetual Help, one of his favorite paintings in his Ocean City home, in a 2015 photo. Speitel died this past week at 93. Father Edmond J. Speitel celebrated the 60-year jubilee of his priesthood in May 2015. Speitel worked at St. Frances Cabrini in Ocean City at the time. He died this past week at 93. Father Edmond J. Speitel looks through letters at his Ocean City home in a 2015 photo. Speitel died this past week at 93. Generations of Speitel men are shown in this family photo from the Rev. Edmond J. Speitel's collection. From left are Edmond J. Speitel Sr., the Rev. Edmond J. Speitel Jr., Edmond C. Speitel (nephew), Edmond C. Speitel (grand nephew) and Edmond C. Speitel (great grand nephew). The Rev. 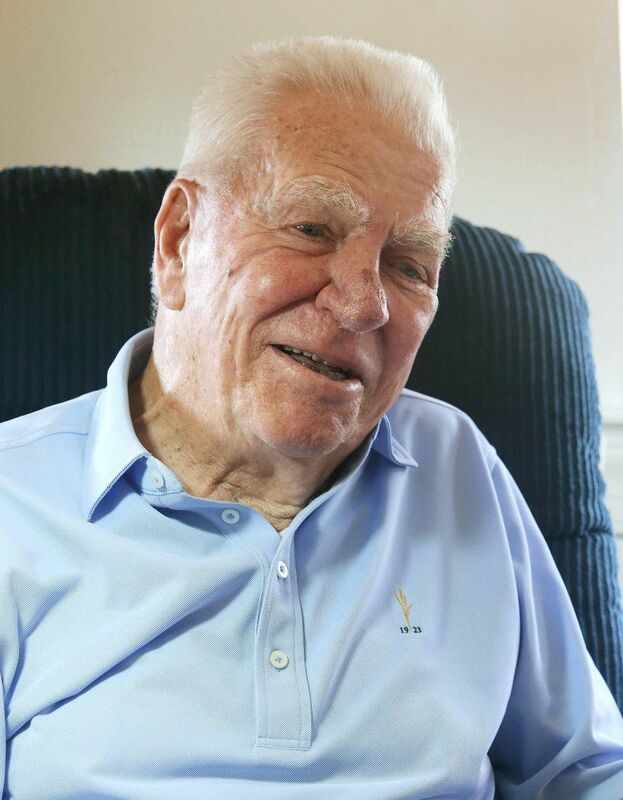 Edmond Joseph Speitel, a World War II and Vietnam War veteran, decorated chaplain and local priest, died Tuesday, April 2, at 93. Father Ed, as he was known, had a more than 60-year career that ended in July 2015 at St. Damien Parish in Ocean City, where he spent the last 17 years of his priesthood. That is where Deacon Joseph Murphy, who currently presides over St. Joseph’s Catholic Church in Sea Isle City, first met Speitel when Murphy began his own path to ordination. He said Speitel’s sermons were meaningful and never meandered, lasting a minute to a minute and a half long. “He always hit the nail on the head,” Murphy said. “It looks easy, but it’s not, especially if you don’t take your homily off the internet,” Speitel told The Press of Atlantic City in 2015, as he was preparing to give his last sermon at St. Frances Cabrini Church. Murphy had served as a detective in Philadelphia for more than 30 years before he decided to join the priesthood. Speitel mentored him during his studies. “He would always encourage me to stay with it, not to give up, not to get weary and not to let the work get you down — that you’re working for God,” he said. And when Murphy worried he didn’t have the education to become a deacon, Speitel continued to encourage him. “You got a master’s degree in street smarts,” Murphy remembered Speitel saying. Speitel graduated from LaSalle College High School in Pennsylvania in 1943, after which he enlisted in the Army to fight in World War II. He told The Press he knew he wanted to be a priest, even then. He was ordained May 19, 1955, serving in the Archdiocese of Philadelphia from 1955-63. He started a career as an Army chaplain in 1964 that included multiple assignments stateside, as well as duty stations in Germany, Vietnam and Korea, and one helicopter crash. “I really preached a homily that day,” Speitel said of walking away from the accident. He also received several decorations, including the Legion of Merit, the Bronze Star and the Combat Infantry Badge. He retired from active duty as a chaplain colonel in 1988.